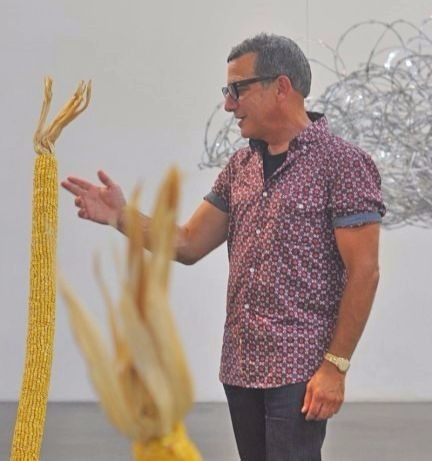 Your guide, Bill Kleiman, is a Santa Monica based sculptor, an art advisor, and an avid art fan with over 30 years experience in the Los Angeles art scene and ten years experience guiding organized art tours. Bill is passionate about sharing his love of visual art, and has a unique ability to make contemporary art accessible, pleasurable and entertaining for novice and seasoned art viewers alike. Read our reviews. He can also assist you in acquiring art or starting a collection. With each tour he strives to demonstrate how art is a living, breathing cultural medium – as relevant and compelling as that new song that you locked on “repeat,” or that twelve-episode streaming series you binge-watched all weekend. A graduate of Los Angeles’s Otis/Parsons Masters in Fine Art program, Bill also holds a BA in Studio Practice from UC Berkeley. He has exhibited throughout the Los Angeles area, where his work has received consistently enthusiastic critical accolades. If you are interested in exploring Bill’s artwork, click here: WWW.BILLKLEIMAN.COM.